Hello! It's time for a brand new Mojo Monday sketch (#243). It's Round or Square week, and Julee has a great sketch for us this week! 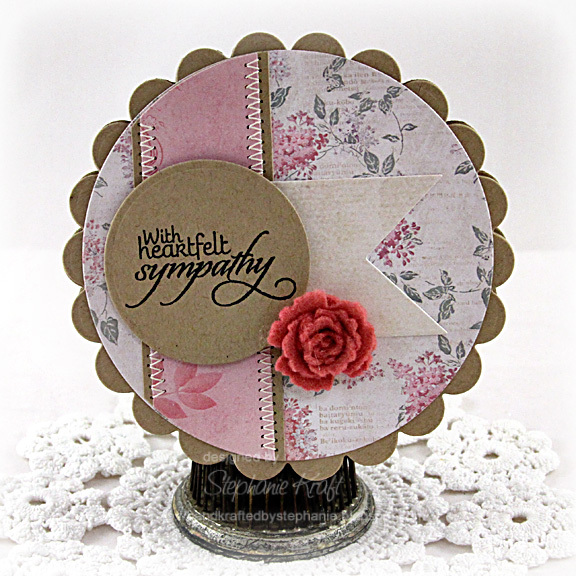 I was in need of another sympathy card, and this time I used New Mercies and made a round card using some soft pastel paper from the Melissa Frances C'est la Vie collection. Accessories: A Cut Above Dies: Ribbon Banner (Verve), Grand Circle and Grand Scalloped Circle Nestabilities, Standard Circle Nestabilities (Spellbinders); Die-namics Mini Royal Rose Die (My Favorite Things), Felt, Foam tape, Thread, Sewing machine. Love your shaped card :) Great use of the Kraft color! Great mojo card, Stephanie :) Love how you used the kraft and the felt rolled rose is fabulous. So pretty Stephanie! Great mix of Melissa Frances DP and the rolled felt rose is beautiful! Happy Memorial Day! So beautiful, Stephanie! Love the stitching! So pretty!! the stitching does add so much to it! Beautiful!!! Love the stitching detail! Such a soft and lovely card, sure to bring comfort during a difficult time. Beautifully done, Stephanie.